You can continue to hit your head against the wall if you want to, but really, all you end up getting is a headache! I think one of the most difficult things as a caregiver is to remember we must change how we approach, treat, and deal with our loved one with Alzheimer’s as the disease progresses. We must be vigilant and remember to be on the lookout for the ways we have to change as well. My husband, Bob, was diagnosed with Alzheimer’s five years ago. At that time, he was cognitively functional and we were optimistic about his future. We thought he would beat the disease. We called ourselves ‘Team Blackwell’ and made all decisions together. At first, it seemed things were working to our advantage. Aricept and Namenda made a huge improvement in his memory and, for a year at least, I felt I had him ‘back’. Bob enrolled in a clinical trial and we thought that perhaps this drug would be the ‘magic bullet’ that would cure Alzheimer’s. Naïve, yes, but some drug WILL be ‘it’ one day. It just didn’t work out that way for Bob. Five years ago, Bob was able to drive to the senior citizen courses he signed up for, do some shopping, have lunch with friends, and life, though different than the retirement we planned, was pretty good. Bob remained relatively independent and we enjoyed our time together. He started a small photography business and we traveled. The disease, however, doesn’t take a holiday. It can move slowly, but it is relentless. Bob slowly declined but, last spring, Bob began a steeper cognitive decline and our lives changed more drastically. Bob could no longer take courses. He became confused as to which courses he was taking and what room they were in. While Bob still takes photos, he puts the camera on the wrong setting more and more often. We can no longer travel and I blame myself for not catching onto this change in behavior faster than I should have. Maybe I did not want to. The change in routine of a new location, new scenery, plane trips, etc. etc. caused Bob to become very agitated and confused. I realized that what worked in the past for us wouldn’t work anymore. We are still ‘Team Blackwell’ but not to the extent we were. I miss that. I now have to make almost all decisions---for us and also for his mother who still lives with Alzheimer’s at age 97. I can’t remember deliberately lying to Bob in our almost 45 years of marriage. Now it comes easily to me—not because I like lying, but because he can’t comprehend or deal with the truth. I don’t even feel guilty about it anymore! I know he can no longer safely stay home alone. He now attends day care 3 days a week. We call it the ‘activity center’. It works very well for him. As an extrovert, he enjoys being with other people and he now has some friends there. They have music and art therapy, great food and many activities. He can no longer read, and it takes him a long time to eat a meal. I eat more quickly than he does, so I read a book to him while he finishes his meal. We read books about World War II. He even sometimes remembers part of the book, but regardless, he enjoys being read to. He has more and more trouble finding the words he wants and much of the time I really have no idea what he is talking about. I used to ask him what he was talking about so I could be clear on an answer, but I learned that he didn’t really know. Now I just listen, nod and say, “Sounds good” or “you’re right”. He seems more content if he thinks I know what he is talking about, even if I don’t have a clue. I am not trying to sound ‘Pollyannaish’ (is that a word?) about the disease and its effects. I hate it, and there are days when I become frustrated with him and even angry even though I know he can’t help what the disease does to him. There are days when I feel lonely and miss ‘my Bob’, my best friend. I think we can allow ourselves some time to have a ‘pity party’ for our loved one and for ourselves. But, staying stuck in that place doesn’t help. 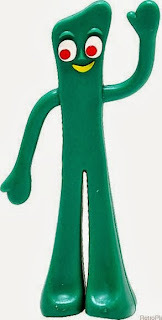 We must be’ gumby like’ and stretch. Part of our job is to pay attention to how the disease is progressing and try to alter our tactics or approach to make things easier for the Alzheimer’s patient. It is different for every person, but I do know that trying to use the same approach that worked in the beginning won’t work in the later stages. We have to be creative and hang in there—and try and find some joy in each day. Go Gumby!